A native Virginian, Michael Roberts grew up in the suburbs of the resort city Virginia Beach. After high school, he attended Norfolk State University pursuing his studies in music education, eventually changing paths and auditioning for and then accepting a scholarship to the prestigious Berklee College of Music in Boston, Massachusetts. 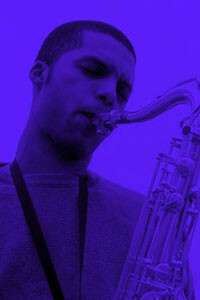 While attending Berklee, Michael was given the opportunity to study with best-selling contemporary smooth jazz artist Walter Beasley as well as perform at several venues across the east coast United States such as the Trinity World Music Festival, Urban Hip-Hop Awards Boston, and the Norfolk Jazz Festival. “It was then that I learned the importance of love, romance, and just plain simplicity, communicating with the audience in such a way getting them to feel every note emanating from your heart and soul. I was really able to cut my teeth as a saxophonist playing as the lead saxophonist for the Eagle Heights Church in Revere, Massachusetts. There is a feeling like no other when you are sharing your passion playing for the greater maker up above.” Michael went on to graduate with a Bachelor’s degree in Professional Music. Recently playing live houses around the Tokyo Shibuya-Shinjuku area with various groups, Michael is especially known in the contemporary jazz circle for his unique, passionate sound which is rhythmic, yet soulful and silky. He believes that his musical journey is far from over, and there are always new things to learn when it comes to music, and in life.